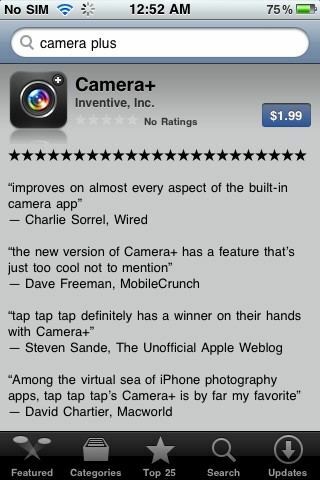 Camera+ Back to the App Store with Lead Update ! by Unknown on Tuesday, December 21, 2010 in App Store, Update. A few months ago, Camera+ was pulled from the app store because it violated certain provisions of the SDK. As announced by tap tap tap yesterday, Camera+ 2.0 is now live in the app store including a huge list of new features and interface improvements, such as a redesigned lightbox, faster start-up times, a timer shooting mode, lots of new modes and effects. From a first look at the app, it looks like one massive update. You can purchase the app for $1.99 from here. Tags # App Store # Update.